Is the Lulla Doll Sleep Aid Toy Safe for Babies? 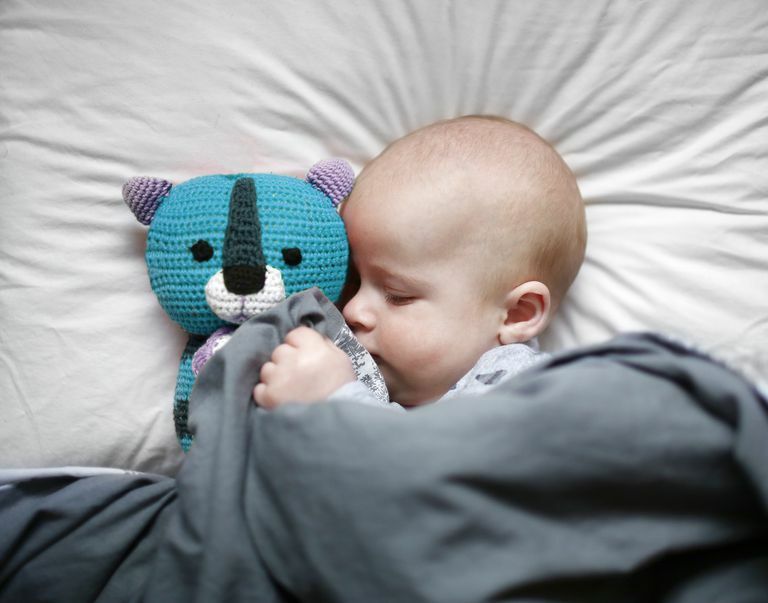 Are the Lulla Doll and Other Sleep Aids Safe for Babies? If there's one thing that parents are desperate for, it's more sleep. And now, there are sleep aids on the market that promise to help new parents get it. For example, a new toy called the Lulla Doll, a sleep companion doll, has been getting rave reviews from sleep-deprived parents for its seemingly magical ability to help babies get to sleep faster and stay asleep for longer periods of time. A sleep aid that works like that certainly sounds amazing, but is it safe? What Is a Sleep Aid? Toys like the Lulla Doll are supposed to work by promoting sleep in infants. For example, the Lulla Doll claims to work by imitating the closeness of a human caregiver resting next to the baby. It has the soothing sounds of real-life breathing and even a heartbeat. The breathing and heartbeat play for eight hours straight, which the makers claim is based on research that proves that having the feeling of a caregiver next to the baby (without the dangers of co-sleeping) can help the baby sleep continuously for longer periods of time. Other types of sleep aid toys promise similar results. Some let you record your own heartbeat so the baby can hear it, others offer white noise to help lull the baby to sleep, and others use special lights to help the baby naturally be cued to get into sleep patterns. One study by the American Academy of Pediatrics (AAP) found that, although parents may claim that sleep aids work well for their infants, the research actually points to the fact that babies tend to use a lot of different objects for falling asleep, instead of just one favorite object. Younger babies, for example, tended to rely more on sucking as a sleep aid, while babies around 6 months of age tended to show a preference for a soft or cuddly animal or blanket. Are Sleep Aid Toys Safe? Although the AAP has not made a direct statement specifically about the Lulla Doll, or other sleep aid toys on the market that have similar designs and ideas, they have been very clear about their safe sleep guidelines. Namely, that babies should never, ever sleep with anything near them. That includes humans, blankets, loose bedding, loose clothing, or stuffed animals of any kind. All babies should be put to sleep on a flat, firm sleeping surface with fitted sheets and no blankets, loose clothing, or anything else soft in the sleeping area. The AAP recommends that infants share a room, but not a sleeping area, with a caregiver. Loose and soft objects, which would definitely include the Lulla Doll, unfortunately, can pose a suffocation and possible overheating risk, both of which are factors in SIDS-related deaths. Although the Lulla Doll notes that it comes with a Velcro strap so that you can adhere it to the baby's crib or near the baby, it still does not adhere to the AAP's safe sleep guidelines. The doll could come loose, posing a suffocation hazard to the baby or the baby could get his/her face trapped against the soft doll pressed up into a crib slat or side and have his breathing airway restricted. So, by the AAP's standards and guidelines, the Lulla Doll is simply not a safe sleep aid for a baby. Should You Try a Sleep Aid? Right now, the AAP is not recommending that parents use any kind of sleep aid to help their infants get more sleep. If you are feeling like your lack of sleep is affecting your activities of daily life in a severe and potentially dangerous way, please speak to a doctor about your options. You or your baby may benefit from sleep training, outside help, or medical assessment to rule out any underlying causes of missed sleep. The AAP does state that controlled sleep training has been shown to be effective, so that may be a better option for you to explore, but as always, talk to your pediatrician to see what options may work best for your family. Burnham MM, Goodlin-Jones BL, Gaylor EE, Anders TF. Use of sleep aids during the first year of life. Pediatrics,109(4): 594-601, 2002 Retrieved from http://pediatrics.aappublications.org/content/109/4/594.short. Price AM, Wake M, Ukoumunne OC, Hiscock H. Five-Year Follow-up of Harms and Benefits of Behavioral Infant Sleep Intervention: Randomized Trial. Pediatrics,130 (4) 643-651, 2012. Retrieved from http://pediatrics.aappublications.org/content/130/4/643. Task Force on Sudden Infant Death Syndrome. SIDS and Other Sleep-Related Infant Deaths: Updated 2016 Recommendations for a Safe Infant Sleeping Environment. Pediatrics,138, 2016. Retrieved from http://pediatrics.aappublications.org/content/138/5/e20162938.